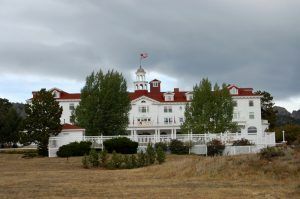 The Stanley Hotel in Estes Park, Colorado is not only famous for its old-world charm and excellent service, it is also known for its “active” paranormal phenomena and spirit folklore. The 100+-year-old hotel, located about five miles from the entrance to Rocky Mountain National Park, offers panoramic views of Lake Estes and the Rocky Mountains, and especially Long’s Peak. This old hotel was built in the early 1900’s by F.O. Stanley, who created the Stanley Steam Engine — a steam-powered horseless carriage. The majestic Georgian style hotel opened in 1909, catering to the rich and famous. Freelan Oscar Stanley (F.O.) and his wife, Flora, traveled west to Colorado in 1903 because F.O. Stanley’s doctor advised him to seek the fresh mountain air. Stanley, who suffered from tuberculosis, had been advised to not make plans beyond six months. The doctor arranged for the couple to stay in a friend’s cabin in Estes Park for the summer. Immediately, they fell in love with the area and F.O.’s health began to dramatically improve. After spending the summer in the cabin, Flora wanted a home like the one she had left in Maine and the couple built their new home about one-half mile west of where the Stanley Hotel would later be built. Today the house is a private residence. F.O. Stanley built the hotel on land that he purchased from the Irish Earl Lord Dunraven. Dunraven came to the area in 1872 while on a hunting trip. He built a hunting lodge, cabin, and hotel for his guests and illegally homesteaded up to 6,000 acres in an unsuccessful attempt to create a private hunting preserve. Dunraven was finally run out of the area after trying to swindle folks out of their land and money. Stanley Hotel Lobby by Kathy Weiser-Alexander. In 1906, construction started on the Stanley Hotel. Wood and rock were obtained from the nearby mountains and the hotel was built in the Georgian architectural style, which experienced a revival in the early twentieth century. In 1909, the luxury hotel was complete, with no expense spared. Equipped with running water, electricity and telephones, the only amenity the hotel lacked was heat, as the hotel was designed as a summer resort. In addition to its regular guests, the hotel is also said to play host to a number of otherworldly visitors. The most notable is F.O. 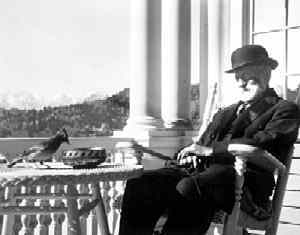 Stanley himself who is most often seen in the lobby and the Billiard Room, which was his favorite room when he was still alive. 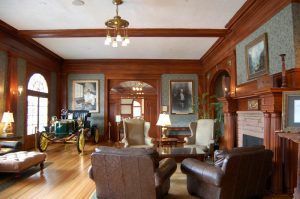 On one such occasion, he was said to have appeared during a tour group’s visit to the Billiard Room, materializing behind a member of the tour. Bartenders at the old hotel also report having seen F.O. stroll through the bar, disappearing when they try to cut him off at the kitchen. Piano on the Stanley Hotel Ballroom by Kathy Weiser-Alexander. Not to be left out, Flora Stanley also haunts the hotel, continuing to entertain guests with her piano playing in the ballroom. 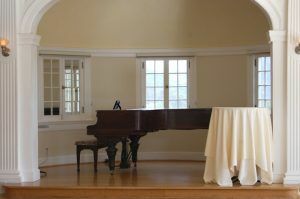 Employees and guests have reported hearing music coming from the room, and when they take a peek in there, they can see the piano keys moving. However, as soon as someone walks across the thresh-hold to investigate further, the music stops and no more movement can be seen upon the keys of the piano. There are several rooms in the hotel that seem to be particularly haunted. One is Room 407, which is said to sometimes be occupied by Lord Dunraven, who owned the land prior to F.O. Stanley. Reportedly, he likes to stand in the corner of the room near the bathroom door. On one such account, witnesses reported that a light in that corner kept turning on and off. While the light was off, they told the ghost that they knew that he was there, they would only be staying two nights, and would he please turn the light back on. The light turned back on. However, later when the lights were turned off and they were trying to sleep, noises were constantly heard from the nearby elevator during a time when the elevator was not in use. 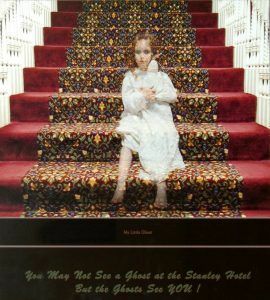 At other times, a ghostly face has been reported to be looking out the window of Room 407, when the room is not booked. Room 418 gets the most reports of haunting activity apparently from children’s’ spirits. Cleaning crews report having heard many strange noises from the room, as well as seeing impressions on the bed when the room has been empty. When guests stay in the room, they often report that they hear children playing in the hallway at night. One couple reportedly checked out of the hotel very early in the morning, complaining that the children in the hallway kept them up all night. However, there were no children booked in the hotel at the time. There have also been many reports by guests of haunting activities in Rooms 217 and 401. Tour guides tell a story of the ghost of a small child who has been seen by many of the staff in various areas of the old hotel. Reportedly, Stephen King also saw the child, who was calling out to his nanny on the second floor. 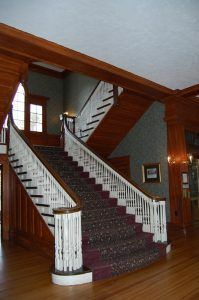 Other past employees report footsteps and apparitions seen throughout the building. Listed on the National Register of Historic Places today, the Stanley Hotel is open year-round and offers various accommodations including historic rooms, modern apartment-style residences for extended stays, and expansive condominiums. The hotel offers both historical and paranormal tours.